Bob Smith co-founded Sage in 1996 with Mark MacQueen, and serves as the firm’s President and Chief Investment Officer and leads the Investment Committee. He began his career in 1970 at Moody's Investors Services as a member of the Corporate Bond Rating Committee; he then went on to Loeb, Rhodes & Co. to cover the insurance industry in the Institutional Equity Research department. He later worked at Merrill Lynch & Co. for 13 years in a variety of institutional research, trading and portfolio management roles in New York and London. During this period, he was assigned to the Saudi Arabian Monetary Agency as a Resident Financial Advisor in Riyadh responsible for managing the foreign reserves of the Central Bank. Bob Smith received his M.B.A. in Finance from New York University Stern School of Business, is an Accredited Investment Fiduciary (AIF) and Certified Investment Management Consultant (CIMC). Good Capital Project: Give us a sense of your personal story - what was your journey to impact? Bob Smith: My journey started about 15 years ago when we were asked by our clients to consider evaluating social risk within the context of fixed income investment portfolios. This resulted in a negative-screening process to eliminate companies involved in tobacco production, religious issues, international affairs/human rights, alcohol, and carbon emissions. We wanted to eschew certain segments of the market in an attempt to incorporate social values while investing to create better returns. Over the past 7 years, we have had more confidence in moving away from negative screenings and toward more progressive investments that embrace positive outcomes. Now we are buying into company policies and corporate decisions based on how those companies engage with stakeholders and communities locally and globally. This gives us an opportunity to mitigate potential risks when managements’ decisions don’t align with the interests of the bondholders and clients we represent. I believe most credit analysts are born in Missouri because it’s the “Show Me” state. Believing in data is vital and incredibly important when it comes to credit analysis. 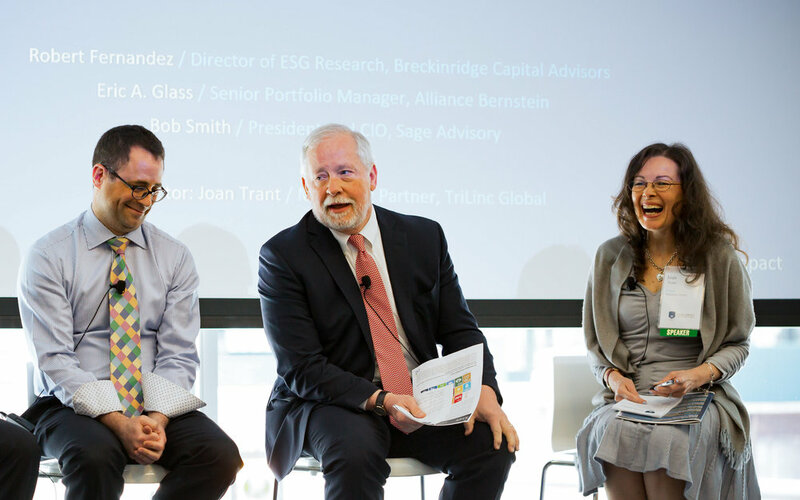 Seeing ESG-related information more consistently produced by a variety of industries gave Sage Advisory the comfort to sit down and deploy ESG values into our investment decision process. GCP: The shift that you just described; is that a common narrative? Has the initial interest of negative screening evolved towards a more progressive outcome-based strategy? BS: Yes, that’s true. As fixed income investors, we are inherently wired to be very careful and critical. The glass is always half empty for a bond person, while the glass is half full for an equity person. Negative screening is a comfortable place to be for a bond person because it gives them a reason to cut out credits; however, it’s very difficult to apply progressive screening to a fixed income frame of mind unless it’s approached from a risk mitigation perspective. As a risk manager, you always glean information from events that provides insight into what is likely to occur in the future. You need to have insights into a company’s cash flows, market capitalization, and balance sheet strength. Then prospectively, perhaps you need a credit rating depicting different incidences occurring in the environmental, social, or governance space. You also need insights into how management reacts to those incidences and what policies they adopt or disband as a result. Sustainalytics did an interesting study that was published in 2017. They evaluated how many incidents occurred among their database of several thousand companies around the world. They found approximately 29,000 reportable incidents (i.e., safety, environmental dumping, bribery, and sexual discrimination issues) in their database. The calibration of these issues ranged from severe to not-so-bad. The study found that when high to severe incidents occur, most companies lose on average about 6% of their market capitalization. When looking at these issues, retrospective analysis isn’t the answer. At that point in time, ESG analysis of the potential impact on the bottom line, length of recovery, and impact on credit quality and bond value is required. GCP: Can you talk a little bit about the need for an independent audit agency to provide critical analyses helping advisors and investors be more proactive? BS: Traditional investors focus on standard metrics – return, risk, and other modern portfolio statistics. From an ESG perspective, investors are required to have all that information and more in order to quantify impact. So therein lies the problem. This space has gone from living in an informational desert to an absolute blizzard. As of last year, according to the Global Initiative for Sustainability Ratings, there were 652 ESG data products being produced by 157 organizations. ESG data coverage is being provided on approximately 5,000 to 9,000 companies around the world. Everyone has a different way of scoring impact, which complicates the process. Everyone can agree that greenhouse gas emissions are bad, but to what degree of bad is where we disagree. Throughout the process of ascribing values to metrics, investors must stick to one consistent ESG-related framework to apply to all portfolios. While we recognize there is no right way, there is a mostly right way that is practiced by large data providers that have been in this space for a long period of time. We want organizations with long track records of looking at ESG data, that understand the nature of the capital markets, and that incorporate that information into their decision-making process. When building our portfolios early on, we were struck by the difficulty of finding a data provider that was willing to segregate data – not just on a stock ticker basis, but on a CUSIP basis. This was another barrier to entry for bond managers who wanted to embrace ESG, because they would have to map stock ticker data to CUSIP. We overcame that barrier with the help of Sustainalytics and, to some degree, Bloomberg. Now, we report all client portfolios on a line item-by-line item basis. I could give you all of the various ESG scores for everything I have in a portfolio, then roll it up to a total portfolio score on a daily basis, which is unheard of in this business. All stakeholders in this sector are trying to develop a sensitivity, awareness, and buy-in for ESG. However, sector-wide buy-in comes down to a simple notion – if we don’t see it, then we don’t believe it. GCP: Do you think buy-in is a barrier to the growth of the industry? BS: Let’s say, a manager said, “I’m really good at managing social values and integrating ESG analysis. It’s essential to my decision-making and portfolio construction process. I look at it every single day.” The client loves that response because they’re about to see pie charts and illustrations, which helps them visualize the impact of their investments. Then, the first month’s report comes around. The client is looking at a list of names, coupons, and bond ratings, but she wants to see more of the aforementioned infographics and less lists. Unfortunately, the manager can’t compute those pie charts on a monthly basis. The client will only receive a quarterly report from the portfolio manager describing an overview of how well the portfolio has done in ESG terms. I can tell you right now, that let down is a complete turn off to clients. Managers need to be able to quantify how companies that are integrating ESG values and operating in a responsible way are rewarded. There has to be more evidence and notoriety supporting this assumption so the public takes notice. Then the public will be inclined to look up companies operating responsibly, and choose those over companies that aren’t following the same standards. We are seeing encouraging signs that ESG investing is moving forward – people are becoming progressive and innovative with the use of ESG data to help determine outcomes from a creditor/cost of capital perspective. As we move forward, there is a profuse amount of interest from millennial investors; however, one barrier that needs to be addressed is that many 401(k) plans are void of any ESG options. By 2025, millennials will constitute roughly half of the workforce in America. We need to start listening to what these clients want because they will have boatloads of interest in the 401(k) market. When given the option to invest with values and financial outcomes in mind, 90% of millennials said they would do it. However, currently there is no list of options for them to choose from, which is going to change because this is a large portion of what millennials want. Providers of investment services have to sit up and listen or they will lose their market share. And millennials are going to see what is available online, so robo-advisors could be the vehicle to rapidly introduce ESG into the market. GCP: Final thoughts on what is needed to unleash the next round of growth? BS: All we can do is give clients assurance that the investments we make can hold water and that they deliver what we promised. Transparency and verification are crucial to getting more buy-in from the buying public. There is a lot to be done from an academic standpoint – knowing credit risks of events, the timing, and if you can build alpha in a portfolio. On the equity side you have a bunch of reports, but on the fixed income side there is very little. Sage Advisory is trying to address that. If you want impact investing to be full-throttle, then asset allocation must be in stocks and bonds. Right now we are top-heavy with about 90% stocks, mutual funds, and ETFs, and maybe 10% of fixed income. It is difficult to build a 60/40 portfolio without standardized reporting, and we aim to change that.